The microservice architecture also referred to as Microservices, is a unique technique of building software applications as a group of autonomously deployable, minute, modular services in which each and every service operates a unique process and connects via a well-defined, lightweight mechanism so to achieve a business objective. Microservices can be used to create enterprise applications where you are not sure what all devices you will have to bolster in times to come. Because of scalability, this system is regarded as ideal when you need to garner support across a wide array of platforms as well as devices across web, IoT, mobiles, and wearables. Today, industries are shifting more towards microservices looking at the huge scope of developing highly scalable, customizable, cloud-based, platform independent applications. Before moving your team to microservice architecture, to read more on what is microservices, refer here. From the industry perspective, the future of microservices lies in Function-as-a-service(serverless). Microservices provide a good starting point for scalability of the cloud applications. Microservices will focus more on the integration layer that ties multiple microservices together. One of the greatest opportunities in microservices lies in the potential for reusability & microservice sharing. Intelligence-driven microservices with the in-memory computer doing real-time analytics. Event-driven programming with progressive web apps. Better tooling for rapidly building and deploying microservices will eliminate the need for a large upfront investment. Outsourced microservices that are easy to integrate into a microservice ecosystem allowing companies to offer more advanced capabilities faster. The entire application stack will be more decentralized. More inclination towards real-time data science & analytics. More combinations of microservices, functions, and services. But when you think about shifting your monolithic architecture to microservice it is not a “lift and shift”. Organizing & managing a team around microservices is always challenging to balance the mood, morale, and the overall culture. One good way to approach microservices development is to consider the structure of the output as a direct reflection of the team structure. Better team structures yield better software. Almost any organization can adopt this approach to maximize the value customers derive from that software. But you can’t build successful microservices without a successful team culture. As established organizations move to modern software development practices, they tend to modify team responsibilities, including the ownership of various aspects of the development cycle. The famous phrase “self-organizing teams,” used in the Agile Manifesto, may describe how some software cultures make those adjustments—organically and easily, with limited confusion. One way to generate higher value in software is to deliver it faster, enabling rapid feedback from customers. Faster delivery cycles, in turn, put software improvements back into the hands of customers, ideally enabling you to make them develop faster than your competitors can. For faster prototype delivery it is required that the software must be built as independent services that can be stitched together to form an application or system. So the first decision is identifying the degree of independence of your services for which you can adapt any of the two approaches. Each of which has its own pros and cons. Each service is completely independent with its own Database and UI. This is consistent with an extreme microservice architecture where services really share nothing and are completely decoupled. The nice thing is that the team for each microservice can choose the database that best addresses their requirements. However, this approach challenges the consistency and syncing of data stored. You can choose to share some components, usually your Database. This makes it easier to enforce standards across all teams and ensure data consistency across all services. However, this also means your services are not completely decoupled and any data modification query can affect your services. To align with the customers’ demand for continuous delivery, you need to have the right automation in place. It needs your team’s expertise and favored technologies, are taken into account while choosing a tech stack for your microservices and then adjusting your team’s level of freedom to pick and choose their tools. That way, every section of your team can get involved in major projects, and nobody will feel like they’re being left on the bench. are constrained to produce designs which are copies of the communication structures of these organizations. For a software application to function in sync, multiple developers of each individual module must communicate frequently with each other over the software interface structure(API/GUI) of the system. Let us imagine an organization with separate vertical teams for each service, where the team owns the API, business logic, and the data layers. The teams are no longer dependent on any other team. The key is the API layer. You can use it to establish contacts between different vertical teams so that each can develop at its own pace, using the same API to integrate or leverage services from the other teams. A modern software company has hundreds or thousands of services running as part of their system. The sheer diversity of their applications makes continuous delivery even more challenging. The goal is to deliver value at speed and scale without sacrificing quality, and a shift in team structure around the principle of Conway’s Law can help with that goal. For instance, Amazon ships 136,000 deploys per day or roughly 1 per second. It’s not just about adopting new technology or tools for software development, it’s fundamentally about changing the culture of how you build software. Teams want to see their work being used. The cultural shift here begins with a simple alignment of people around the build process as well as simplifying the technologies to some extent, to make the developer’s life easier. Like when an engineer would jump around between apps, they wouldn’t have to learn a different language each time. How your team is structured is also going to impact your microservices engineering culture. Mostly in the microservice architecture, the team builds the application in a decentralized governance, such as each module of the application is associated team’s responsibility. However, the primary business reason is that we want teams that are responsible not for a specific code but for customer-facing features so that there are fewer cracks for things to fall through. A “build-and-run team” following the Agile process, ideally consists of six to eight people, but certainly no more than 10. This team owns everything from development to operations, including testing and product management for a chunk of software throughout the entire lifecycle. So developers are on “pager duty,” because the team is responsible for the quality of their service in production. In order to deliver value faster to your customers, teams must be organized in a way that allows them to own what they’re responsible for, end to end, this is what Amazon calls “you build it, you own it”. 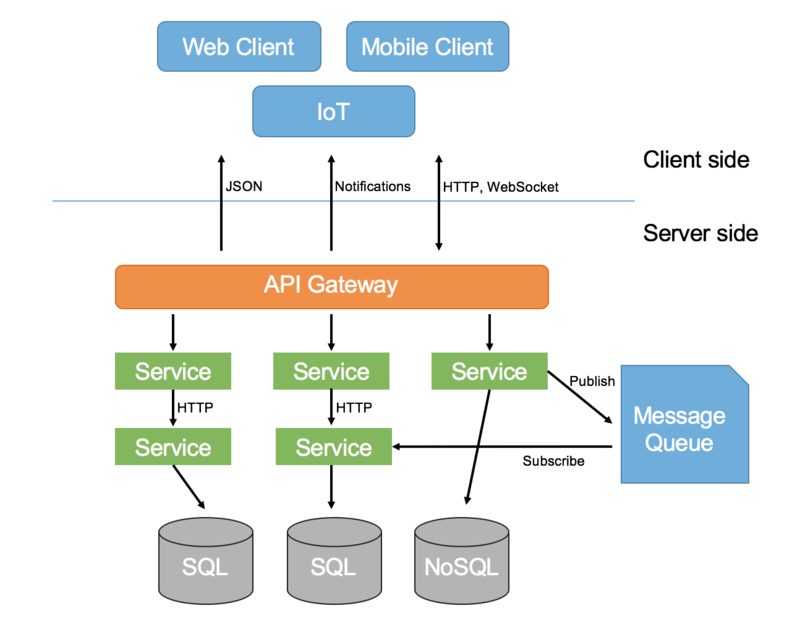 Microservice architecture makes it easy to manage, deploy and connect application modules. It is a big player driving strategic growth for the organization. In the API economy, microservices are a by-product that can be efficiently used to deliver greater business value to your customers.